Vacation ideas in and around Cumberland County Tennessee. What to do. Where to stay. Click on an area on the map or any picture for more information. Should the map not load, or your browser not support hotspots, the same links are available in the text below the map. I-40 cuts through Cumberland County. One can fly to either the Nashville (BNA) or Knoxville (TYS) airports. Via I-40, it takes about an hour and ten minutes to drive from TYS, and more than an hour and a half from BNA. But you will probably find a larger selection of flights to Nashville. For international flights, it may be worth the nearly four hour drive to the Atlanta Airport. An overnight to Europe or South America is miserable enough without a long layover. Your chances for a non-stop are much better from ATL. Of course, getting here can be super easy if you have a small plane. On the west side of town is Crossville Memorial Airport which accommodates smaller craft. This is a road map to the Crossville airport. If you have smaller children, the pool is a main feature when choosing a place to stay. From mid-June through a week into September, the water in an outside pool will typically be warm enough for adults to swim with the children. Regardless of the choice of lodging, you can swim at the Cumberland Mountain State Park pool. So for summer, even with children, you can choose any place. But at cooler times, you may want an indoor pool. Tansi and Fairfield Glade resorts have one, and so do some of the hotels. Camping is available at the Bean Pot, Ballyhoo Campground or the Cumberland Mountain State Park. For fine dining, I might suggest Halcyon Days Restaurant just north of I-40 on Genesis Road next to the Stonehaus Winery. Lake Tansi and Fairfield Glade have nice country club restaurants open to the public. You should make reservations for all those dining rooms. Forte's on the Square is across the street from the courthouse. Kids will enjoy the buffet at Ryan's Steak House, on the north side of Crossville on 127. In that same area, you'll find all the familiar places for fast and not so fast food. If you are staying at Fairfield, you only have to wander out a little way on Peavine Road for Manny and Isabella's or Lefty's BBQ. For an extended list of our personal favorite restaurants and dining places click here. If family members like to golf, this is certainly the right place. Lake Tansi and Cumberland County State Park have courses, and Fairfield has four! Also, one can fish and boat at any of these. Cumberland Gardens (931)484-5285 is a spectacular (and high) course. Also see River Run Golf Course and Deer Creek Golf Course. That's not all of them, not at all. See the Crossville chamber's page on tourism for a bit more information. An easy and short hike is at Ozone. A picture of the falls (it isn't usually so full) is on this page. This map will get you to a listing of other nearby waterfalls on the Cumberland Plateau and scroll down this page for hiking trail difficulty levels. Don't miss seeing at least one play at the Cumberland County Playhouse in Crossville. Check this link to see what's playing before you leave. Call the Cumberland County (Crossville) playhouse (931-484- 5000) and make reservations for what you want to see. Should you want a piece of the mountain for your own, call on Plateau Properties. They sell wooded terrain. Rhea County. The town in Rhea nearest the plateau is Spring City. One possibility for an interesting and brief day trip is to go to Spring City and eat at Watts Bar Dam completed in January 1942 by the TVA. If you eat there, why not keep on going to Sweetwater to the Lost Sea. Very pretty, and the climate inside is always the same. I like to wear a light jacket going in. Coming out, it is usually tied around my waist. Roane County. The edge of Oak Ridge is in Roane County. Another good day trip is to visit the American Museum of Science and Energy in Oak Ridge. It has plenty of hands-on stuff. 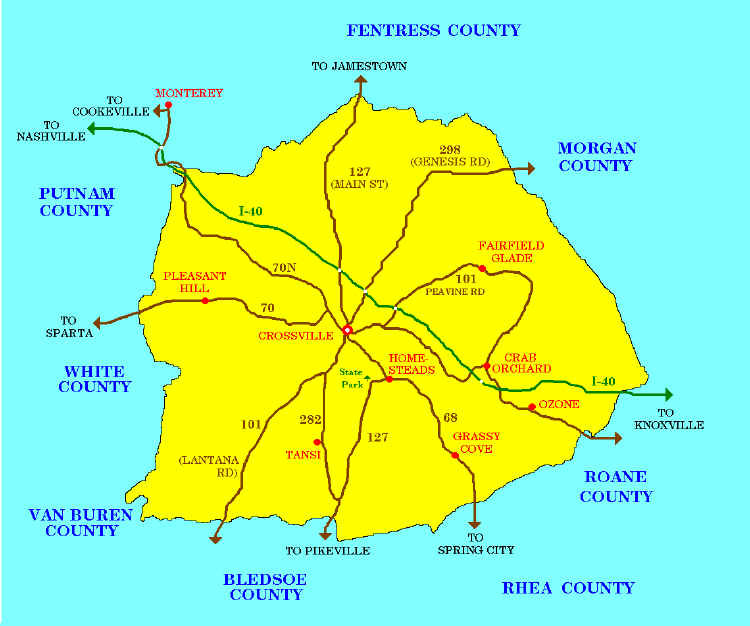 Fentress and Morgan Counties: The enormous Big South Fork recreational area is partly in Fentress County and partly in Morgan County. You can ride horses at Eastfork Stables on the plateau with 100 miles of trails on 12,000 acres. Along highway 52, where one crosses from Fentress into Morgan at Big South Fork is the English settlement of Rugby. Well worth a visit. It is an experience to attend old Christ Church there, regardless of your faith. Putnam County. A town in Putnam near the edge of the plateau is Monterey. 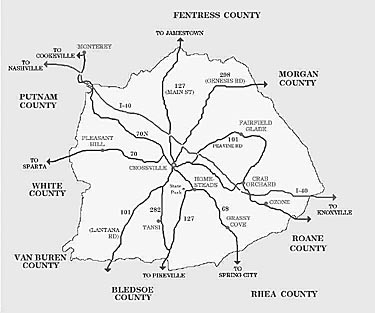 The county seat, Cookeville, is about 40 miles from Crossville. South of the Cookeville is Center Hill Lake. There are several movie theaters there near I-40 if the movie you want is not playing at the new Rocky Top 10 Cinema in Crossville. White County: the county seat is Sparta. For day trips, try Rock Island Park or Burgess Falls, or go through White County to McMinnville in Warren County and visit the spectacular show cave Cumberland Caverns.